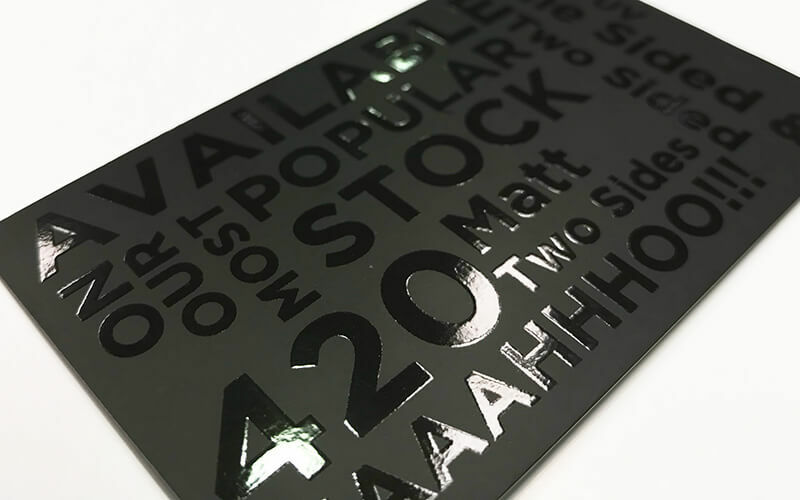 Spot UV printing is a subtle way to lift your card by adding glossy shine to an matte business card. Here’s how you can turn heads with your spot UV business card. Think business cards are outdated? Think again. For every 2,000 business cards distributed, a company’s sales increase by 2.5%. To put that in perspective, that’s as much of a revenue increase as Coca-Cola saw from its “Share a Coke” campaign in September 2014. But for a fraction of the investment. Not bad for a low-cost marketing tool. At the same time, business cards have come a long way. If you want to stand out among the millions of cards printed daily, your card needs to be memorable. And that’s where a spot UV business card shines (literally). A spot UV business card is a modern twist on the traditional business card. It uses UV varnish, which is a coating that gives business cards a glossy look and texture. The main difference is that a spot UV business card uses the glossy effect sparingly. The varnish isn’t applied evenly across the card like it is with regular UV cards. Instead, it’s used only to accentuate spots of specific text or patterns within the card’s design. This style goes by a variety of names. Spot gloss, raised spot UV, spot varnish, UV spot–but they all refer to the same thing. And the results are always stunning. Spot UV business cards are usually printed on silk satin or matte finish business cards, upping the luxury factor even more and highlighting the raised glossy parts. Talk about judging a book by its cover…ouch! But while it’s clear that you want your business card to turn heads and make a lasting impression, you may be wondering what’s so special about a spot UV business card. A spot UV business card elevates your design to the next level. It’s an opportunity to take a minimalist approach that results in a sleek, professional-looking card. But it’s most effective when used abstractly. There’s no need to go overboard and spot varnish every bit of text on the card. That defeats the purpose. Here are a few ways to optimise your spot UV business card design for maximum impact. Patterns are an eye-catching and appealing aspect of design. But when it comes to your business card, the last thing you want is for it to look cluttered or unprofessional because of a distracting pattern. That’s the great thing about a spot UV business card. Using spot varnish is a lot like selecting a clear or transparent color for aspects of your design. As a result, it can be applied to patterns without looking busy or detracting from the important information on your card. One really cool application of UV coating is the “ghost” effect. Basically, in certain angles and lighting, your spot varnish looks invisible if there’s no printing underneath it. But with a small tilt, the gloss catches the light and you can see the coated design over the card. The effect is simple to achieve but packs a big wow-factor for potential clients. All you have to do is select areas to apply the varnish without printing under it and you’re there. It’s an intriguing way to spark conversation and get people really looking at and playing with your business card. It’s great for logos, patterns, photos, and other information that doesn’t need to be visible at all times. When you’re designing a card that’s part matte and part glossy, there’s no need to go overboard on color selection. After all, your eye is already differentiating two different textures. Add much more and you’ll distract from what matters: your contact information. But a plain white card isn’t the answer either. People hold on to colored business cards about 10 times longer than they do white ones. Plus, 78% of people say they’re more memorable too. For jaw-dropping results, limit your spot UV business card design to no more than three colors. The spot UV will take care of the rest. You can (and should) work with a professional printing service to create and optimise your spot UV business card design. After all, they’re the experts and know what works…and what doesn’t. But that doesn’t mean you should go into the venture without your own ideas. Mock-ups and visuals are a great way to communicate to your printer what you’re hoping to achieve. But it’s all very straightforward. There’s no need for any special effects or layers in your file. Your printed design is just that. It represents what ink will be printed on the card. But to get that “ghost” effect we mentioned earlier, simply leave out any elements that you want to be spot coated only. Instead, put them in the other file, so they’ll get the clear coating without any ink underneath. Giving it an illusion-like look. For your UV spot area, create your design in pure black and white. The black areas will end up with clear-coating, but the white areas will not be varnished. It’s that simple. You can also layer it over your other design for a better idea of what will be UV spot coated. Just keep in mind, it’s recommended that you make your designs in Adobe Illustrator, rather than Photoshop. Photoshop layers are “rasterized,” which can create unsightly edges on your designs. By contrast, Illustrator uses vector layers, which preserve your nice, neat edges. Now that you’re up to speed on the benefits of a UV spot business card, check out our pricing options and FAQs. We’ll get you handing them out and making lasting impressions in no time. We can even accommodate urgent requests if you contact us.